Gather around the table, it’s Passover! - Scarsdale Premier Insurance Agency | Advocate Brokerage Corp. Gather around the table, it’s Passover! This year Passover begins on Friday April 22nd and runs through Saturday April 30th. 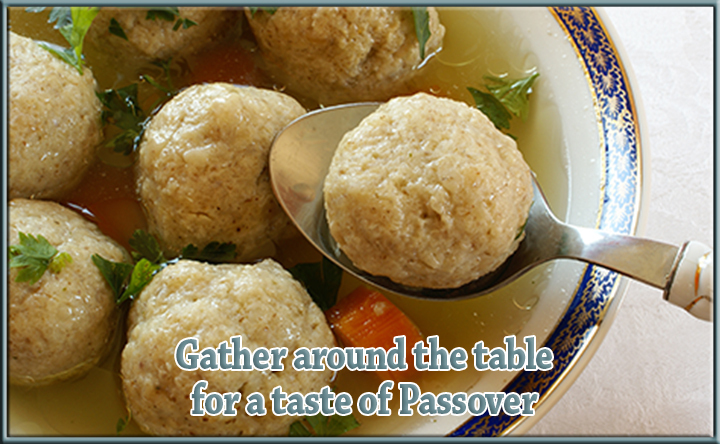 The most celebrated and beloved of the Jewish Holidays, Passover, like most holidays, seems to center around the table. We love our traditions as much as anyone…recipes handed down through the generations but we thought it might be fun to explore 3 of Passover’s most treasured dishes and see if we could interest you in joining us as we try something new! Matzo Ball Soup – Combining two of the key elements of the Seder dinner traditions, the unleavened matzo crackers and the bitter herbs, Matzo Ball Soup is a Passover Tradition. It may also be the most welcoming dish on your table! If you are looking for a new spin on this dish, give the recipe below a turn. Gefilte Fish – We know what you’re thinking…. As Principal Denise Koslowsky says “People HATE gefilte fish but it is good when it is homemade, which in my case means I buy the frozen bar and cook it with onions and carrots.” Well we found this gem of a recipe from NY Times Cooking and the author sure agrees with Denise…maybe you’ve just never had it homemade. Why not give this traditional dish a try! Brisket – A Binday family tradition! We found the recipe below on NY Times Cooking’s Passover Recipe Collection and fell in love. What do you think? We hope you are inspired to give something new a try or at the very least rethink your opinion of gefilte fish. If you try one of the recipes… be sure to let us know how they turned out! What are your favorite Passover foods? What traditions do you look forward to sharing with your family year after year? Do you have any favorite recipes? We would love to hear from you! Post them either in the comments below or on our facebook page!